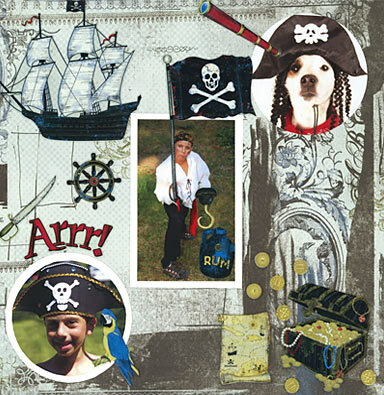 Well 'shiver me timbers', this pirate scrapbook layout 'pushed the boat out'. I decided my photos would benefit from a 'boarding party' of embellishments! Whether this layout works I don't know but I felt like a bit of an experiment. These two little fellas are not carrying a parrot on his shoulder or about to break into a flagon of rum with his hook. It can be fun to doctor your photos at times for effect. Once you start on this road you can end up taking it a lot further than parrots! SKETCH TEMPLATES ARE YOUR TREASURE MAP, ME HEARTIES! AARRRH! That's enough Captain Barbosa. Since making this layout, I have discovered a great tool for saving time, avoiding changing my mind during layouts, and producing better pages. Jen Gormley's '500 Scrapbooking Pages' is a dream for an indecisive scrapper like me. She is able to produce stunning layouts from simple line drawings - templates we can use again and again. In fact if you scroll about half way down this page you'll see an example of what I mean. I found this spooky 12 x 12 at the 'Big Stamp and Scrapbooking Show' in London. It reminded me of the horror film 'The Fog', when those dead pirates come to life in the fog once a year. It goes by the rather unspooky name of 'Cabernet' from the Periphery range by Basic Grey. These stick-on transfers by Sandylion - with the unlikely name of 'Collection de Pirates (honest!) - are a great addition to any pirate layout, and certainly were for mine. A child's birthday party is hopefully the only time you'll come across pirate costumes. Adults putting on the gear and waving cutlasses as each other is scary on so many levels.